I was born in 1969. It was a good year (not that I remember any of it) and hard as it is to believe, I was not the only person born that year. I know, really hard to believe. It is always a dangerous game to start looking for famous people who are your age. It can lead you to wonder “how did they get so (famous, rich, successful, good-looking, etc…) and not me”. Luckily, I’ve got a healthy sense of ego, so here we go. Jennifer Aniston – Me and Rachel Greene….we’re quite a pair. Jennifer Lopez – I’m liking this company I’m in. Jay-Z – Megastar…not like me. Brett Favre – But he is sooooo old! Catherine Zeta-Jones – I have to say there are some pretty good-looking actresses on this list. Rob Ford – Former mayor of Toronto and crack user. I’m not sure I win at this one. I don’t have his drug or alcohol problems, but he was mayor of a major city before me. Kim Fields – You mean I’m the same age as Tootie? Naw…she’s so young! Matthew McConaughey – That one is for the ladies. Not quite as beautiful as Jennifer Aniston, but still a pretty good-looking dish. 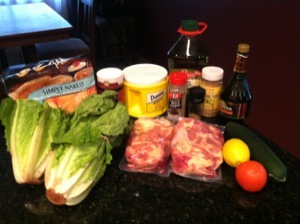 Some of these ingredients are for the salad that is part of the recipe. 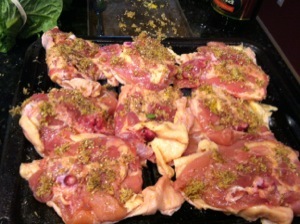 All dressed and ready for the broiler. Preheat the broiler. Make the rub: Combine the sesame seeds, lemon zest, thyme, sugar, 1/2 teaspoon salt and 1/4 teaspoon pepper in a spice grinder; pulse until the seeds are slightly cracked. Season the chicken with salt and all but about 1 1/2 tablespoons of the rub. Set skin-side down on a broiler pan and broil, flipping the chicken and rotating the pan halfway through, until the chicken is golden and a meat thermometer registers 170 degrees F, 8 to 10 minutes per side. 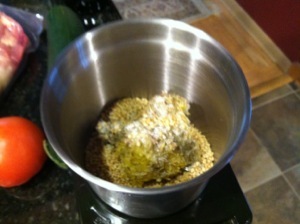 Make the dressing: Mix 1 tablespoon of the reserved rub, the lemon juice, vinegar, and salt to taste in a bowl. Whisk in the olive oil. 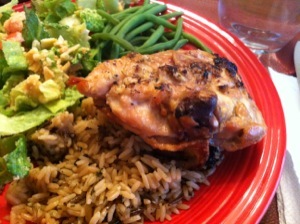 When the chicken is done, whisk 1 tablespoon of the pan drippings into the dressing. Add the lettuce, cucumber, tomato and pita chips; season with salt and pepper and toss. 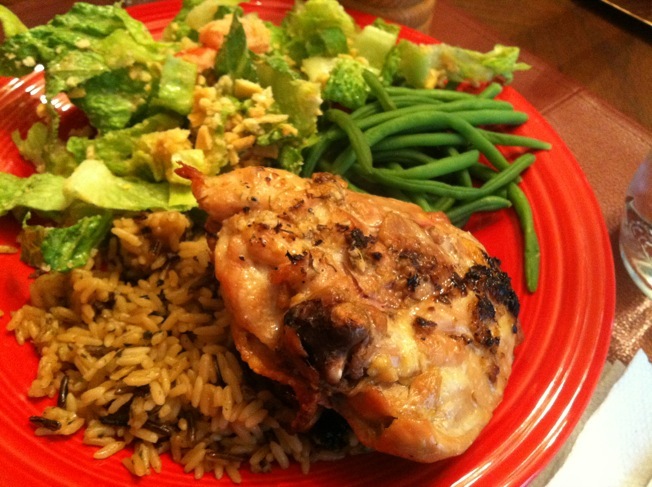 Sprinkle the chicken with the remaining 1/2 tablespoon rub and serve with the salad. This post cracked me up! You should check out the Nostalgia Machine website for the songs that were popular the year you were born! Want to try this recipe! Always looking for new things to do with chicken!